KEEP YOUR CELL PHONE OUT OF YOUR POCKET AND AN INCH AWAY FROM YOUR HEAD, AND THAT GOES DOUBLE FOR CHILDREN AND TEENAGERS! This is a controversial topic, and she lays out every bit of research out there in heavily annotated detail. I'll summarize the most compelling pieces of information below with page numbers from the book. If you want a summary of my summary, just read what's in bold. She explains how radio waves work and why many think nonionizing radiation shouldn't harm us (16). "If nonionizing radiation didn't break ionic bonds, and the intensity used was too low to produce any change in temperature, what trouble could it possibly cause?" (19) One of the biggest arguments against cell phones being a problem is that there's radiation everywhere, right? The sun radiates us. So what's the big deal? Well, nothing sits next to our bodies giving off a constant source of artificial radiation like cell phones do. And there are many experiments that show a serious problem with nonionizing radiation. There’s no money for independent research in science, so almost all research is funded by industry. (Universities are also funded by industry.) So there is no impartiality any longer. 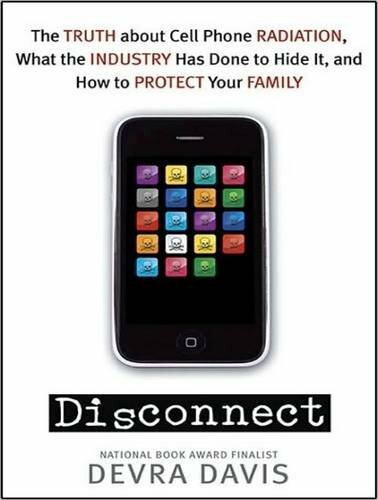 There’s no certainty around cell phones because “this issue has been manufactured by those with deep pockets whose bottom line remains their primary focus…. As it did with tobacco, asbestos, benzene, and hormone replacement therapy” (202). Several governments (France, Finland, Israel) are acting to reduce exposures to cell phone radiation and insisting on more public information (202). We insist on seeing proof that an epidemic is under way before acting to restrain exposures to an agent that damages DNA, weakens the blood-brain barrier, and unleashes destructive free radials throughout the body (203). The Stewart Commission recommends limits on cell phone use and advises that children under age sixteen not use cell phones at all (208). Davis ends the book with this: “Years from now our grandchildren will look back and ask: Did we do the right thing and act to protect them, or did we harm them needlessly, irresponsibly, and permanently, blinded by the addictive delights of our technological age?” (243). Everything on cell phones here also goes for cordless phones and wireless signals to computers. It’s all the same type of radiation. But there’s radiation everywhere, right? “The levels of radio frequency signals that started the only world we know were billions of times less than those that are getting into our heads today around the world” (81). Her information told a compelling story. Below, it’s all chronological. I’ve been told this concern is just another way to get us afraid. I don’t think so. I don’t think telling people to keep their phones an inch from their bodies when they’re on is any more fear inducing than telling them to wear a seatbelt or a bike helmet. I don’t advocate destroying them, just using them safely. Even if the research is all a big hoax (to whose benefit I must wonder), why fight against taking some very simple precautions? Absence of research has become the rationale for making no changes. There are many studies finding inconclusive results, but most of these are funded by the cell phone industry including the WHO Electromagnetic Field project (48). Science is limited by political and economic circumstances that determine what questions are asked, who gets to answer them, and whether that work becomes public (52). Why do similar studies show different results? “Those who set up studies that are supposed to replicate work on the blood-brain barrier, can make changes in the design that are small but critical. Basically what is supposed to be an identical experiment with contrary results turns out to be not similar at all – significant changes have been made to ensure the study won’t work. Studies are done not to clarify the problem, but to confuse people. Most of the studies that find no problem have been sponsored directly by the industry and have used slightly different approaches. The generation of negative studies in this area has been deliberate” – Allan H. Frey (68). “Because the causes of chronic disease can take decades to be detected, we should not wait for definitive human evidence” (56). “It is far easier to keep doing studies aimed at evaluating whether there is a problem and probing the numerous uncertainties of the field than it is to come up with policies to curtail or control potential sources of that problem while studies continue” (49). 3G and 4G phones use a wider bandwidth, and continually send digitally pulsed signals to base stations to get new information. As a result, they can result in greater cumulative exposure to radio frequency signals (46). 1960s - Milton Zaret, an ophthalmologist in New York – examined 1,600 air force, navy, and army workers to see if their jobs with radar and radio frequency exposure had any impact on their eyes. Typically half of all people age 70 have cataracts in both eyes. Almost no one has cataracts in their 20s or 30s or only one eye unless something has damaged the membrane. He found posterior cataracts in men under 40 uniquely tied with microwave exposure (196). 1962 – Safety standards for radio frequency radiation in the U.S. date back to 1962, long before cell phones moved from theory to reality (74). 1970s - Allan H. Frey, Office of Naval Research, demonstrated that radio frequency radiation relaxed the membrane surrounding the brain. This information was used to help chemotherapeutic agents pass across the brain barrier (65). Exposures to radio frequency add up over time. If the same area gets tweaked over and over again, repair may not happen as easily or at all (90). Frey showed that radio frequency signals opened up the normally closed barrier between the blood and brain. He injected dye into the bloodstream of white rats then exposed them to pulsed microwave signals. Within a few minutes the brains of the injected rats began to darken. The rats not exposed to the microwaves did not get dye into their brains (111). Others claimed the studies were wrong through a repeated study in which, instead of injecting dye into the artery where it could circulate, they injected it into the abdomen, waited a minute before killing the rat, then found no evidence that the dye reached the brain because it did have time to circulate completely – they made sure of that (113). 1973 – Dietrich Beischer found radio frequency signals raised triglycerides and blood pressure in humans. Just before he was going to report the results publically, he called a colleague to apologize that he couldn’t make it, and he couldn’t ever talk to him again (157). 1980s - Leif Salford, a neurosurgeon at the Lund, Sweden, was concerned that if microwaves can help chemo get into the brain, what else do they let in. For the past twenty years at the Rausing Laboratory of Sweden, they examined brain cells from rodents using mobile phone exposures of 2-6 hours a day. Animals exposed to just two hours of cell phone signals were much less able to complete simple tasks at which they usually excelled. Even two months later exposed rats remained less capable (66). Using computers to characterize gene patterns, Salford showed that rats subject to cell phone radiation have more direct brain damage, less ability to fix this, and greater chances of growing and acting strangely. Once the blood-brain barrier is breached, then anything circulating into our bodies at the time, alcohol, drugs, toxic chemicals, cigarette smoke, diesel exhaust, will more readily enter the brain from the blood (66). Henrietta Nittby has shown that rats exposed to cell phone signals for just two hours a day for a single week began to leak microscopic fluid from their brains into their blood which makes them vulnerable to taking in other agents in the blood that would normally never enter their brains. The Lund team concludes that cell phone use in children may, “in the long run, result in reduced brain reserve capacity that might be unveiled by other later neuronal disease or even the wear and tear of aging” (67). 1993 – In a memo located by Microwave News, the FDA concluded that several studies showed that microwave radiation increased cancer risk – but by 1997, the FDA changed their mind and decided little is known about the health effects of exposure (44). 1994 - Henry Lai, University of Washington, subjected living rats to two hours of radio frequency radiation at the same level used in cell phones. Brain cells were taken from the animals and evaluated. DNA from the cells of these rats were broken. The broken brain cells found in these cell-phone-exposed animals are the same as those known to occur in cancer. To remain healthy, DNA needs to remain intact. This was the first time we saw direct evidence that cell-phone-type radiation adversely affects DNA (60). 1994 - Mays Swicord, University of Maryland, produced basic research that showed that radio frequency signals at the same frequency as cell phones could disturb the DNA within the center of brain cells for the FDA, but left the year cell phones were approved without any safety testing at all (42). 1996 – The Federal Telecommunication Act prevents local authorities from considering health concerns in deciding where cell phone towers can be placed (42). 1996 - Om P. Gandhi, University of Utah, contracted by the Defense Department, found that radio frequency signals were absorbed much more deeply into the brains of children than those of adults (79). The heads of smaller adults also absorb more radiation. To determine safety levels, the FDA uses a SAM model – a mock-up of a “standard” brain that is similar to a 200 pound man, and uniform in consistency, unlike our own brains which are of varying densities throughout. The SAM model is useless for developing real-life safety standards. 1997 – Jerry Phillips, a Motorola-supported scientist showed that genes of rodents exposed to cell-phone-like radiation looked significantly worse than those of unexposed animals. The paper was published, but someone added a line at the end, “…is probably of no physiologic consequence” that Phillips insists didn’t appear in his original report (43). 2000 – The FDA advised that the National Toxicology Program should test radio frequency radiation for its potential to cause cancer noting that there’s “insufficient scientific basis for concluding that wireless communication technologies are safe” (44). 2000 – Israel – The world’s heaviest cell phone users have triple the rate of cancer in persons under the age of twenty (84). 2000 – A Swedish analysis compared 1,400 people with brain tumors to a similar number without the disease from 1997 to 2000. They found that tumors of the auditory nerve were three times more frequent in people who had used cell phones for more than a decade (182). 2000 – Franz Adlkofer, head of the Verum Foundation which was funded by tobacco money for years. They worked with human cells and rat cells exposed and not exposed to radio frequency radiation found in cell phones. The DNA from the exposed cells looked sick. There was an increase in DNA strand breaks. Not just in this lab, but in two separate facilities as well. They consistently found increases in a type of damage called micro-nuclei, which proves the existence of serious genetic defects leading down the path to cancer (106-7). 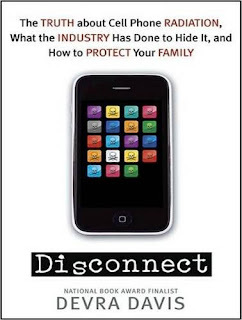 “The kind and extent of DNA damage became a very inconvenient fact of life.” They found ten times higher rate of broken DNA with the new 3G phones compared to 2G (121 – published in the International Archives of Occupational and Environmental Health). Then one of his research assistants suddenly was claimed to have admitted to fudging the data, and Adlkofer was charged with fraud. The assistant later insisted she said no such thing, but his name was already muddied. It didn’t matter that there were, at the time, eleven other independent studies that found similar results (122), the industry published the findings that “Cell Phones Do Not Damage DNA” based on the claims of one piece of fudged research. To make matters worse, the university demanded that all Adlkofer’s research be destroyed (127). 2001 – A commission of the Royal College of Physicians, chaired by William Stewart, said that children might be more vulnerable because of their developing nervous system, the greater absorption of energy in the tissues of the head, and a longer lifetime of exposure. “We believe that the widespread use of mobile phones by children for nonessential calls should be discourage.“ By children, they mean anyone under 16 (91). 2002 – Industry did a major study to prove the safety of cell phones. They reviewed health records of over 400,000 people who signed up for private use of cell phones between 1982 and 1995. They kicked out almost half the people – anyone who was part of a business that used cell phones (that is, the heaviest users), and only included people who used cell phones for personally purposes only and for less than eight years in total. They found that there was no evidence of harm. But, duh, they diluted the high-exposure group to lower their chance of finding an effect (181). They did agree, however, that cell phone signals do penetrate the brain. “During operation, the antenna of a cellular telephone emits radio frequency electromagnetic fields that can penetrate 4-6 cm into the human brain” (182), but they insisted it’s not clearly harmful. 2005 – C.K. Chou replaced Gandhi as advisor to the Defense Department. He also was a senior executive with Motorola – a clear conflict of interest. Under Chou, the committee relaxed the standards for cell phones. Today’s standards for cell phones have more than doubled the amount of radio-frequency radiation allowed into the brain (86). They use a model that holds the phone at least half an inch from the brain to determine levels of impact on the brain. Also nowadays phones are smaller with three or four antennas built directly into their backs. As a result, exposure to radio frequency radiation inside the brain is many times higher (87). Four different peer reviews of Chou’s critique of Gandhi’s work indicated that Chou’s critique was scientific junk (87). All new manuals for cell phones include warnings to keep the phones away from the body – typically almost a full inch. This ensures that people can’t sue if the cell phones cause a problem unless they can prove they used them appropriately. 2008 – Ashok Agarwal, Cleveland Clinic, - Cell phones in the pocket lead to men with fewer sperm with more deformities (138). From a study of 400 men, men with the lowest sperm counts were significantly more likely to keep their phones on their bodies all the time. Men who used no cell phones had far healthier sperm than those who used a phone over two hours/day. Men who used the phone over four hours/day had the sickliest sperm counts. There is a clear and direct correlation between health of sperm and cell phone use (141). These aren’t the first studies to show this – it’s been shown in many different countries over decades (142). 2009 – Melaka Manipal Medial College – “teenaged” white rats exposed for just one hour a day had more damaging free radicals in their blood, reduced sperm counts, and lowered amounts of male hormones. 2009 – German study – Contrasted the life experiences and reported cell phone use of 366 people with deadly tumors of the brain called gliomas and 381 people with slow-growing, benign tumors of the membranes that cover the spinal cord, against 1,500 people between 30 and 69 who did not have brain tumors. Those who reported having used cell phones for ten years or more had twice the risk of gliomas. 2010 – Austria - Children’s brains are smaller and also developing faster. They absorb at least twice as much radio frequency radiation as those of adults. Bone marrow can take in ten times more radiation in children than in adults (82). 2010 – John Aitken, - After little more than a day of exposure to cell phone radiation, sperm becomes sluggish. There’s a dose-response relationship – as the dose goes up, so does the damage. The radiation does not directly damage the sperm’s DNA straight on, as happens when X-rays hit, rather, cell phone radiation weakens the ability of a sperm cell to function (143). Free radicals are generated through leaking mitochondria which harms DNA by weakening the basic structure of the genetic material (143). – Like a rubber band that’s been stretched too many times. 2010 - Lennart Hardell, Sweden, an expert on microwave radiation - “In my studies I find one pattern over and over again. Those who have used their phones the most and for the longest, have more malignant brain tumors than others” (176). Similar findings have been developed by scientists in Israel, Finland, Russian, and England. Hardell has also shown that those who start using cell phones regularly as teenagers have four to five times more brain cancer about ten years later, in their 20s (176). On-going – For the past five years, scientists in Moscow have been following two groups of children between the ages of 5 and 12 – one group using mobile phone and the other not. Every year the children get a battery of tests. They found changes in the working of the brains of the cell phone users ranging from decreased capacity to work, increased fatigue, decrease in attention and semantic memory, and significant loss of the ability to tell the difference between different sounds. They also have functional problems – difficulties with learning and behaviour (61). For the past twelve years, Lukas H. Margaritis, at the University of Athens, employs real cordless phones, Wi-Fi systems, and baby monitors and sends signals into cages where rats live. He then does memory tests with the rats. They are taught to swim to a platform – something they learn easily. Exposed rodents get confused and swim around in circles, unable to remember what it learned just a few hours earlier. Other research from Greece found that the brains of rats whose mothers are exposed to cell phone radiation during pregnancy have cells that look different from those of unexposed rats. Small amounts of pulsed radio frequency radiation leave rat offspring with what looks like brain damage. They also studied a worm that can grow back when the animal is cut in half. After simple exposure, the worm grows back snarled and bent instead of straight and flat (62). There’s another whole section of the book about other concerns with power lines and particularly electricity used in the treatment of sports injuries strongly correlated to Lou Gehrig’s disease – but I just focused on phones here. That was enough!